Today officially marks two weeks of trail life for me and I am celebrating with my second zero. My parents dropped me back off at Neel Gap last week and made their much faster journey north to home. At first I was feeling lonely and overwhelmed because the security of having my parents close by was gone. Thankfully I hiked up behind a lovely woman named Junebug and we started to talk. Junebug’s kindness lifted my spirits and she told me of a campsite she was planning on staying at that night. I hiked past her and approached trail magic again where I got a beautiful hand-knit hat from a church group. After about seven miles I set up camp near four guys my age — Pro, Milkeye, Moonshine, and Handstand — and waited for Junebug. We all stayed by the fire hanging out and figuring out our plan for the next day. The next day my knee and foot were feeling slightly better and the weather was perfect. Around midday the guys and I lay out by a log and enjoyed the warm sun beating down on us. I can’t help but feel like I am the luckiest person alive to just hike and hang out all day. The shelter we stayed at that night was packed. There were around 50 people there, and I saw a few familiar faces I had gotten separated from with my day off. 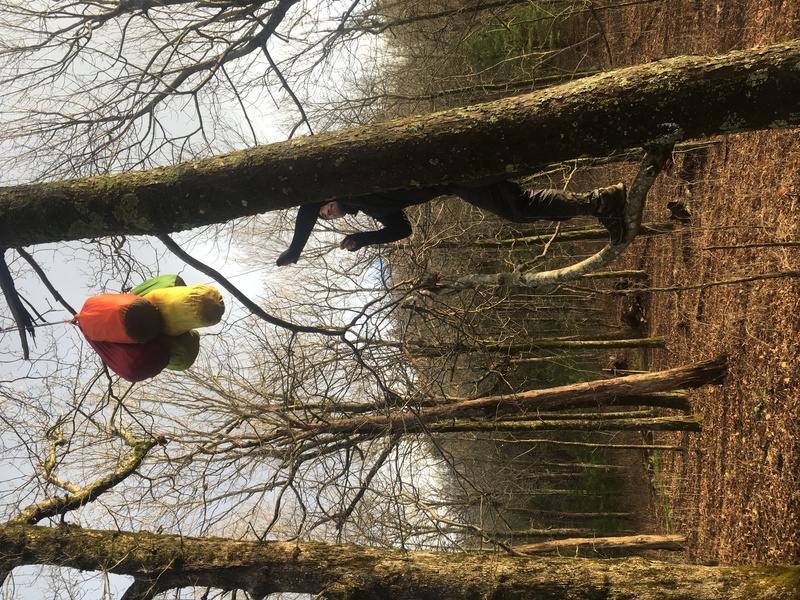 The next day I hiked with Pro, Milkeye, Moonshine, and Handstand again and we set out for a ten-mile day. We hit trail magic again and I enjoyed delicious vegetable soup, which was much needed, before my big climb up the next mountain. That night we decided to stealth camp (not stay at a designated campsite or shelter). We had great weather again but that night we were meant to have a storm. We set up camp near a water source and a guy named Triple Zero decided to set up camp with us before the storm started. We sat around the fire and played a game Milkeye introduced to us called Contact. The game only stopped when we had to run to our shelters as the rain started. My tent was shaking from the storm but thankfully I stayed warm and dry. The next day started with an adventure. 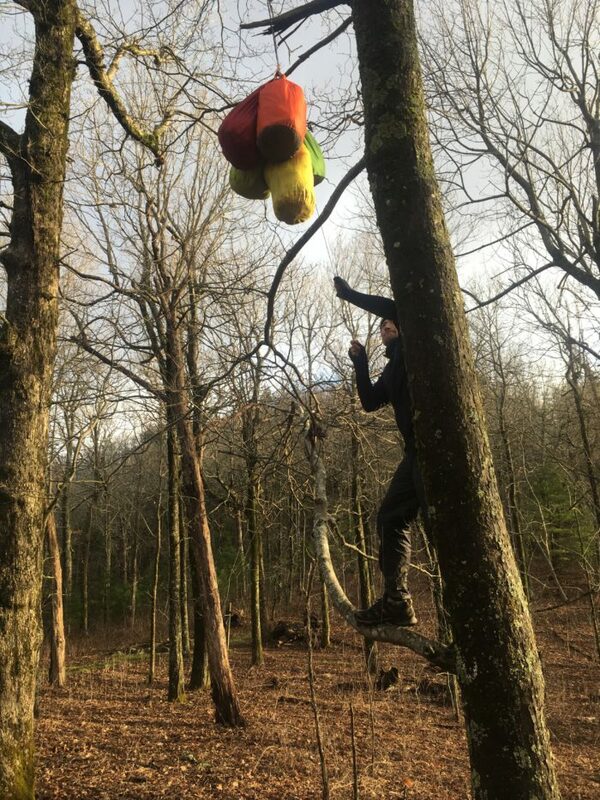 Every night we have to hang our food from a rope in the trees so bears and other animals don’t eat it, and since I was the first one up I tried to get them down but the storm had swung them around all night and they were so knotted I had no other option but to wait for someone else to wake up and help me. Handstand woke up next and he climbed the tree while I maneuvered the rope until we were successful in getting it down. 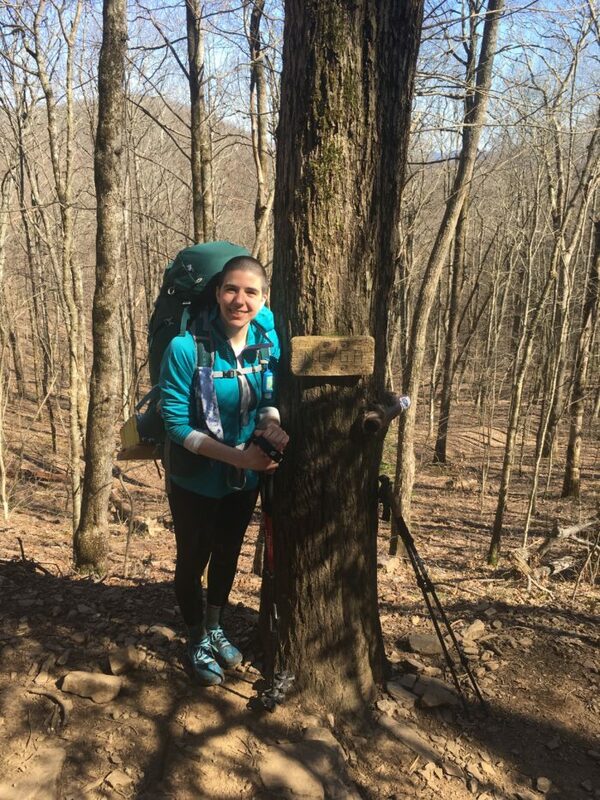 We got off trail that day at Dicks Creek Gap and I successfully hitchhiked for my first time. Our driver was hilarious and the boys and I got a hotel room to split for the night. At this point I really started considering them my trail family. My Aunt Steph and her mom met me in town and took me to Dairy Queen. I told them all about the past few days and I was grinning from ear to ear the entire time I talked about the trail. Day ten was a big milestone. I had my first state crossing! 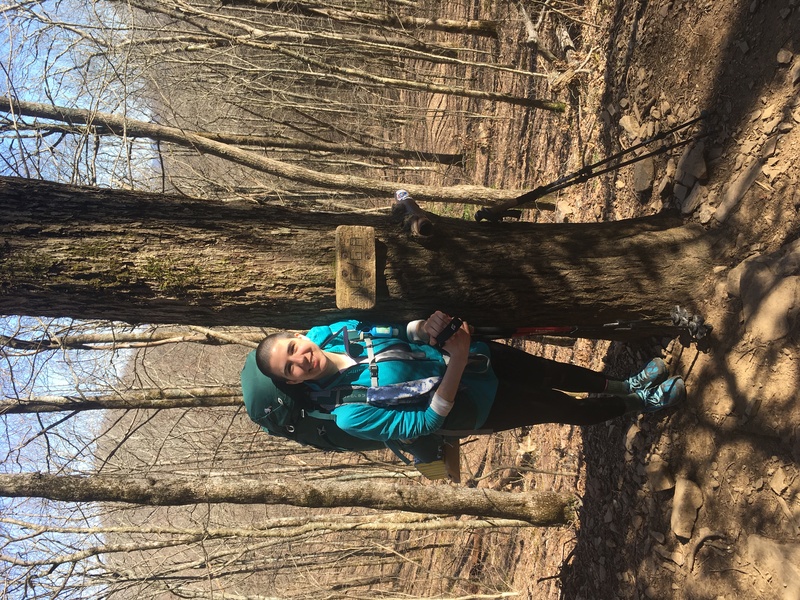 I hiked the entire Georgia portion of the AT and I made it into North Carolina. It was a great hike that day but my pack weighed a ton from all the food I got in town the day before. 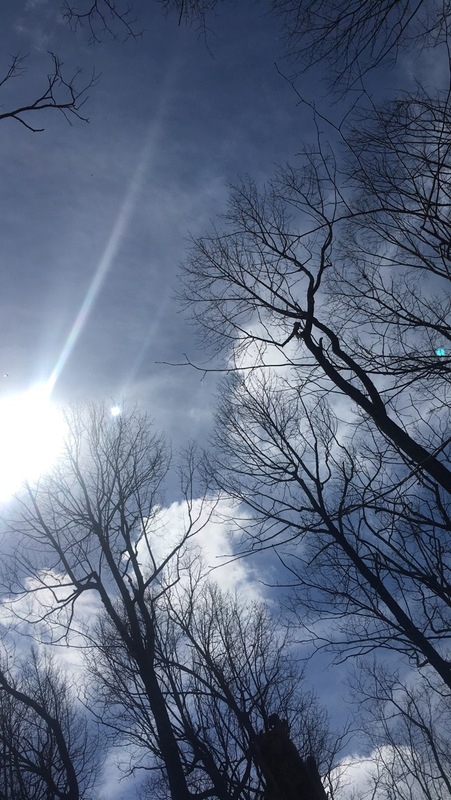 On Easter I hiked my longest day. 15.3 miles plus I climbed to my first summit over 5,000 feet. Some wonderful trail angels had an Easter feast for us. I ate the best omelet in my life and they made me a giant sandwich for dinner that night. I was pooped when I rolled into camp that night but I felt accomplished. The next day we set out to hike 12 miles. I had my third milestone in three days. 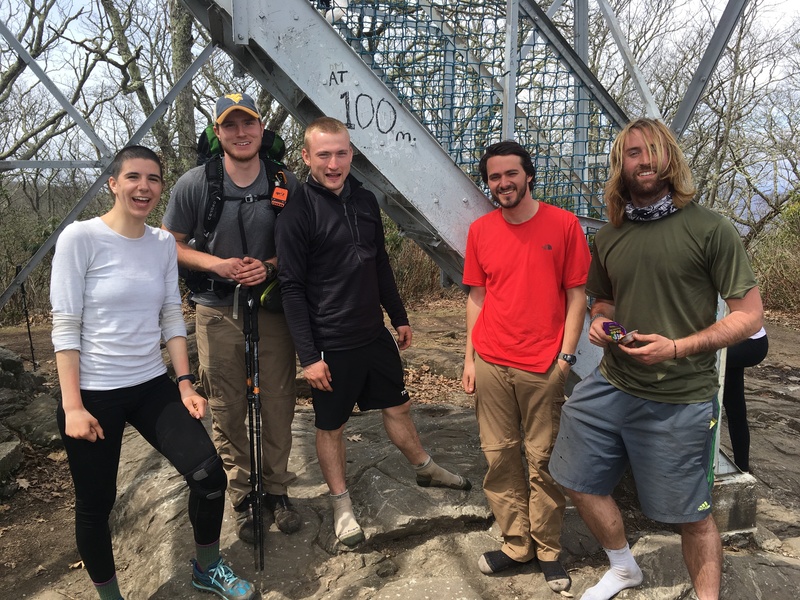 I officially hiked 100 miles on the AT. The climb up Albert Mountain was really intense but the view was more than worth it. We got into camp pretty early and for the first time on trail all of my trail family set up camp and took a nap. We woke up about two hours later and made dinner. That night we could hear packs of coyotes howling as we hung out around the fire. On Tuesday we only had four miles to do before we went into town again to avoid a cold front so we slept in and made a fire and hung out in the morning. We left camp around noon and hiked the four miles to the road crossing where we could hitch into town. My trail family booked our room and headed out to a brewery. We ran into more hikers and all hung out and went for Mexican food that night. At night a bunch of us hung out in the parking lot of our motel before bed. I can honestly say I have never laughed as hard as I have these past few days with my trail family. We are consistently the last ones up at the campsites and we are all just happy to be having this adventure together. No matter what happens on trail, if we get separated or not, I am lucky to have met them. What’s up with the “Wilt” nickname? I was named after a character from Foster’s Home for Imaginary Friends who was named after Wilt Chamberlain.